I have just been setting up a new Windows Server 2008 R2 box up as a terminal server. As part of this I enabled the Desktop Experience feature, however this also enabled Windows Mail. Windows mail seems to generate large amounts of ESENT messages in the log file as it tries to backup the mail database. It also create 5Mb of files for every user as they logon. As we don’t even use Windows Mail, just Outlook for staff I wanted to disable it. There appears to be no easy way to remove it from the system, but you can prevent it from setting up the details for every user when the log on. 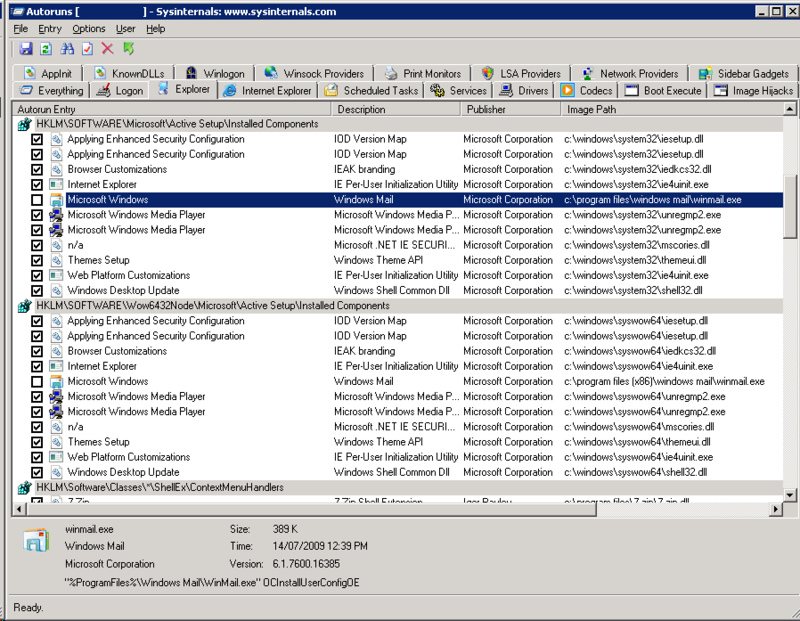 Download and runs the Microsoft Sysinternals program Autoruns as an Administrator and then under the Logon tab untick “Microsoft Windows” under both the Active Setup\Installed Components and the WOW6432Node\Active Setup\Installed Components. Now when a new user logs in it will no longer set up Windows Mail files or shortcuts. This entry was posted in Utilities, Windows and tagged autoruns, server 2008 R2, SysInternals, terminal server. Bookmark the permalink. FYI, On my systems, Autoruns showed these settings on the Logon tab (or Everything tab), and the Description for each was “Windows Mail”. Thanks. I just double checked in Autoruns and in version 10.05 it is in Explorer, and in 10.07 it is under Logon. I’ll update the article to reflect the change.